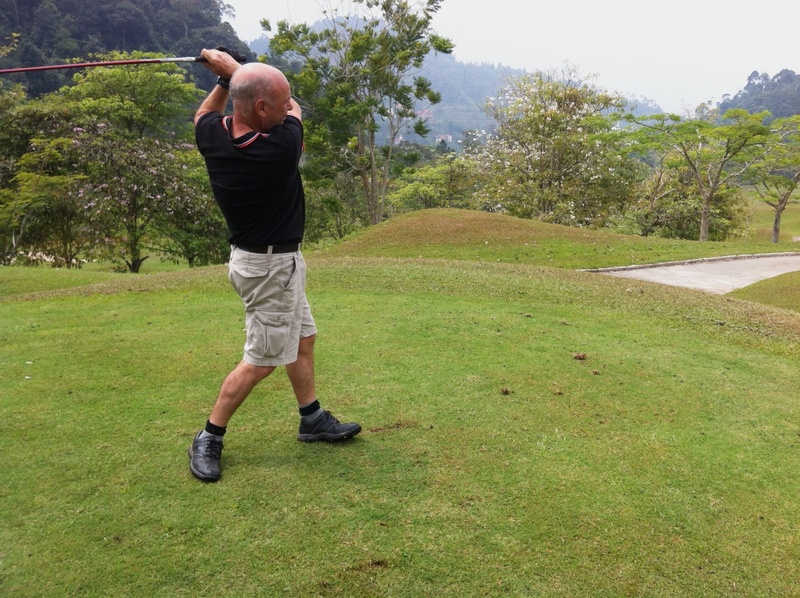 It was a lovely morning with cool air at the top of Bukit Tinggi when 10 of the Loose Cannons tee’d off at 8:00am – a pleasant change from the high humidity of the lower altitudes of the Klang Valley. 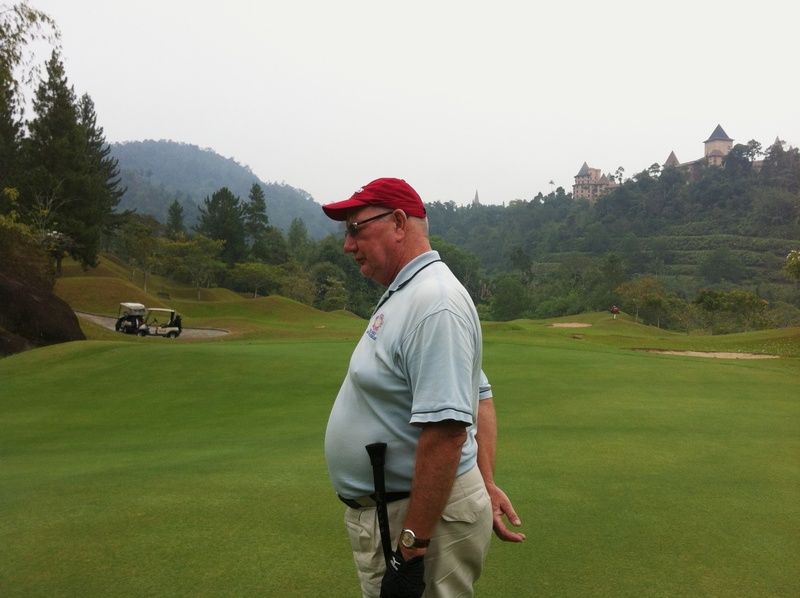 The course was a little patchy with a fair bit of wart hog action on the fairways and in particular the greens were bad having been recently sanded leaving it a rather random process to proceed the ball towards the hole. 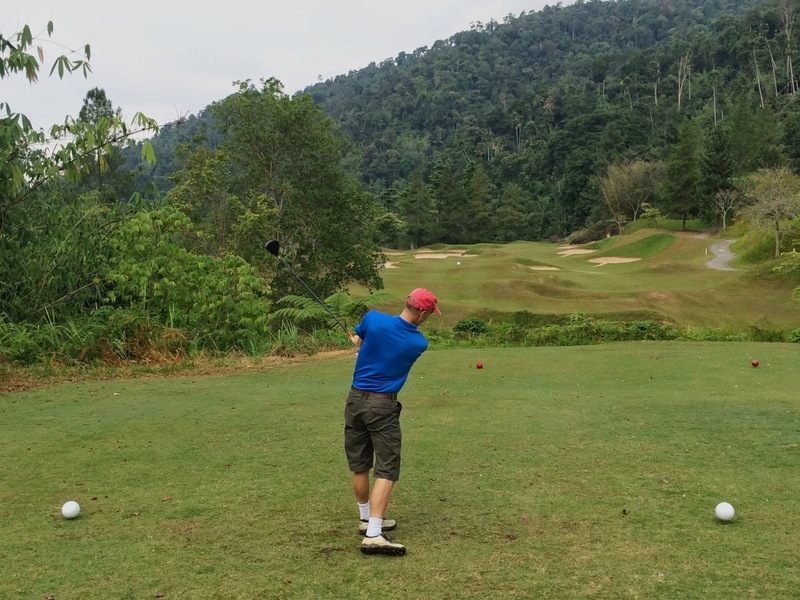 The course however was relatively quiet with only a few other players who decided to move ahead of us to the 10th rather than sticking behind us as we started on hole 1. 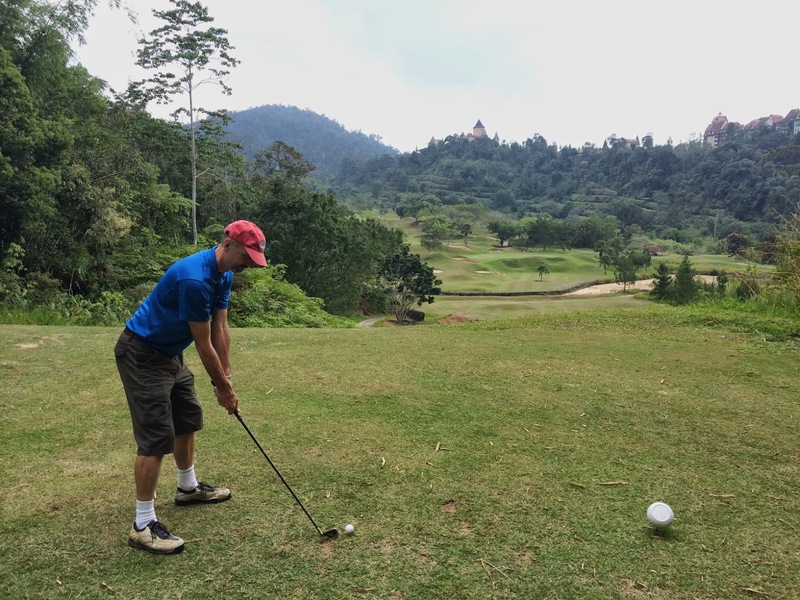 After the game we drove back down the hill to Kampung Bukit Tinggi for a great (and cheap) lunch at Restaurant 126 – well ordered Tony! 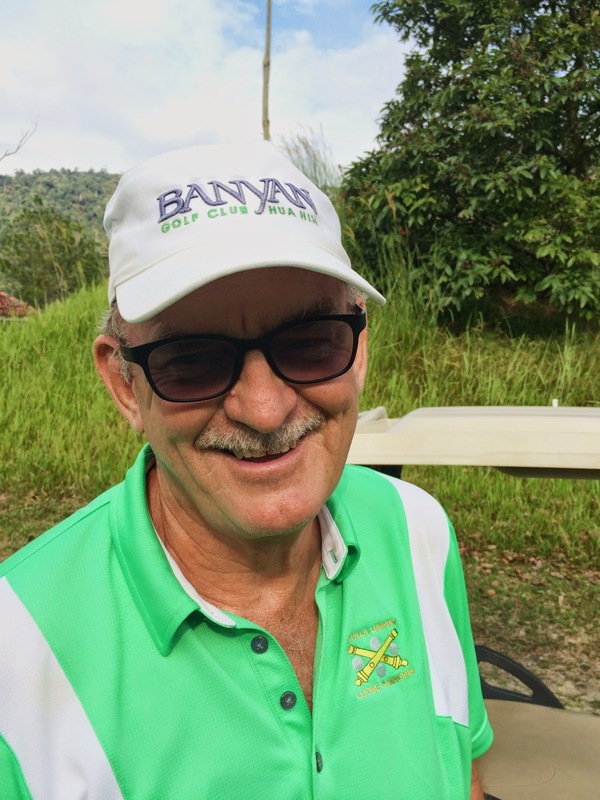 The winner again this week was Barry Sage with a great score of 88 and 40 points (24 points on the back 9!) 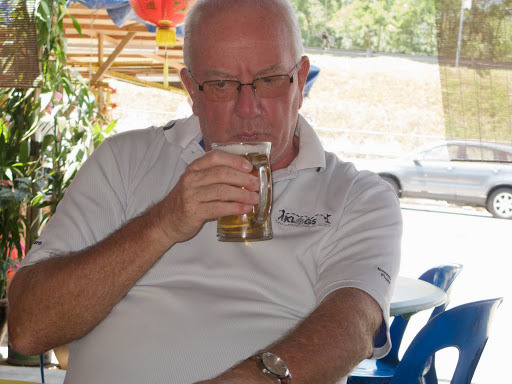 – this is now a back to back win for barry who has obviously found his form. We will be seeing his handicap dropping accordingly! Second was Stuart Taylor with the best gross of the day (84) and 37 points. Please let Ray Funnell know if you are playing and by Monday 1200 hours latest. For the second week running we played in the rain. 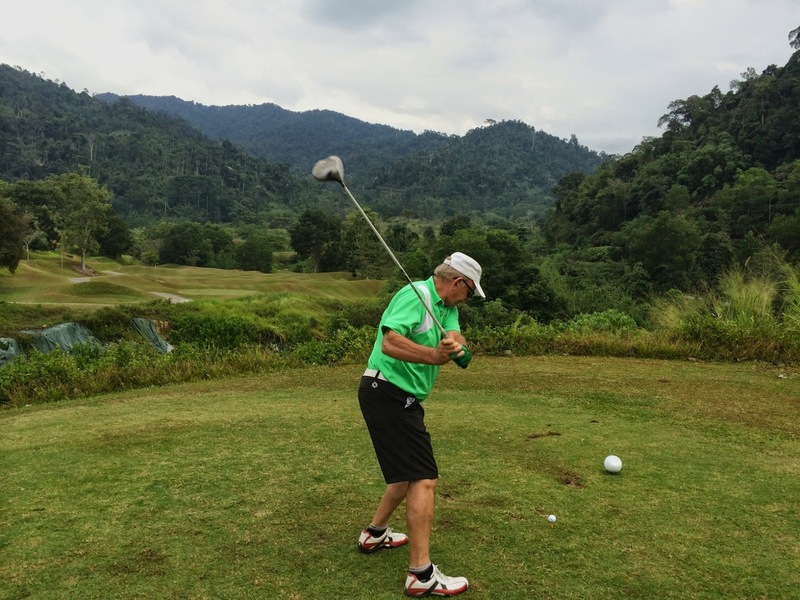 18 LC’s made their way to the mountains through the KL haze and endured the lengthy registration process that seems to be the norm these days at most local golf venues. 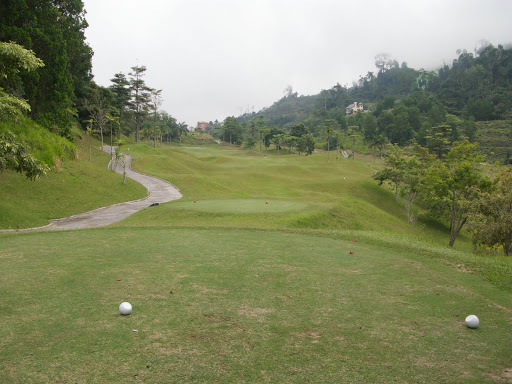 We eventually got started at 8:15 under leaden skies; all from tee box 1 as the tenth tee is at the farthest point on the course, and this always leads to a rather long delay between the first and last flight. But more of that later. 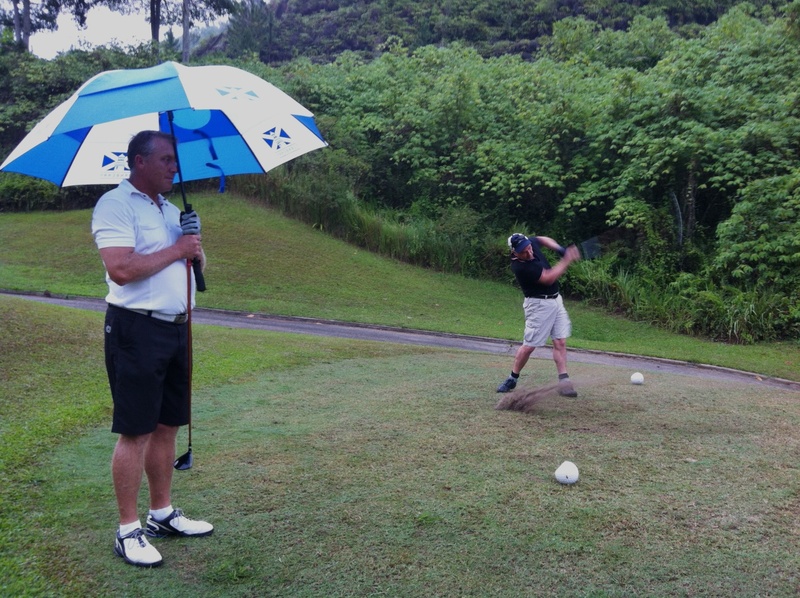 By the time the first flight got to the second tee the rain began; a heavy drizzle, and it continued intermittently for much of the front nine. 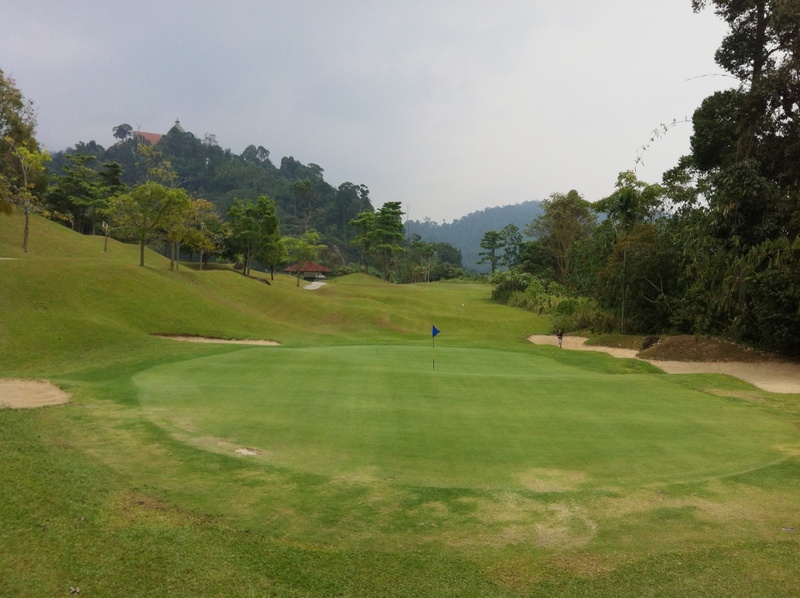 Berjaya Hills was in very nice condition with much long needed maintenance in evidence including the repair of the land slip at the 4th tee box which, while not completely repaired, at least has a new tee boxes to replace those at the foot of the slip and a new buggy track circumnavigating the slip which is a great improvement on the temporary detour across the neighbouring fairway that has been in place for the past year or more. 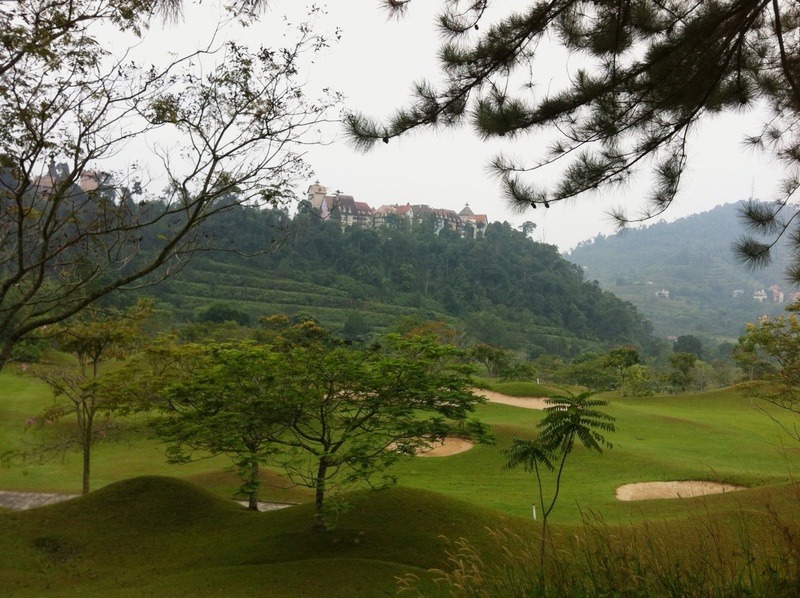 Berjaya Hills is always a delightful place to be, high in the hills with wonderfully clean air and spectacular vistas. The gallery of Gibbons were very noisy, a bit like American golf galleries, and a magnificent Owl swooped into a tree and watched the LC’s putting exhibition with great disdain before silently gliding away in search of something more interesting. The winner OCB was Stuart Taylor with 42 points and the runner-up was Ted Parslow. 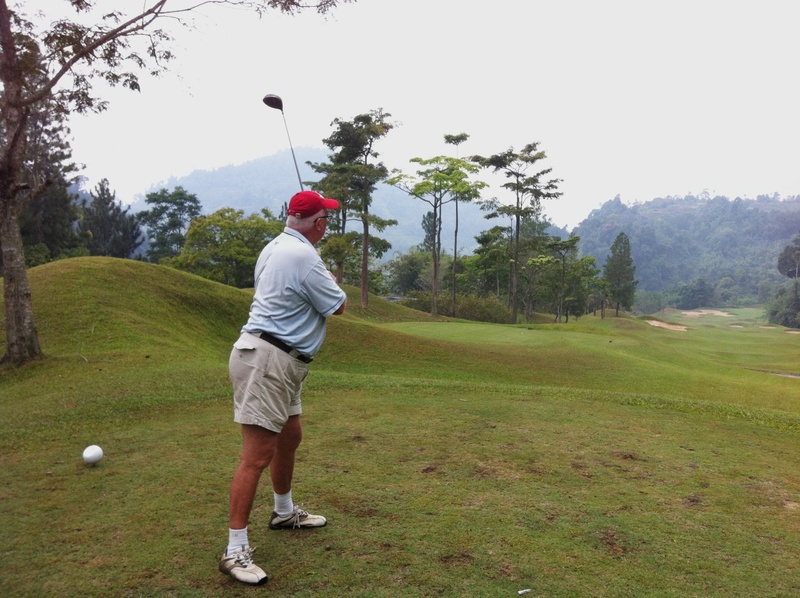 The lowest gross was 77 by Geoff Parlow and the most golf was played by Allan McNicoll with 118. Stuart is cut 6 strokes and Ted1 stroke. As I mentioned earlier, there is always a long delay at this track because we believe that we have to start from TB 1 as TB 10 is so far away. 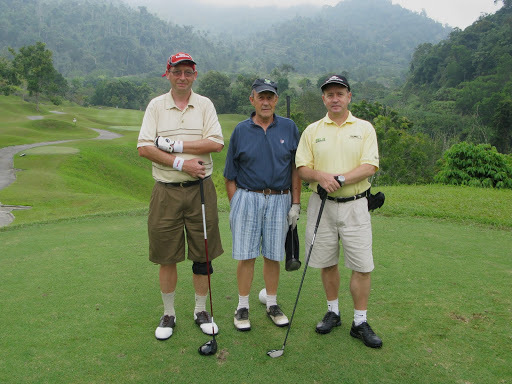 The first flight, a 3 ball, were back in under 4 hours with the second 3 ball 10 minutes later. 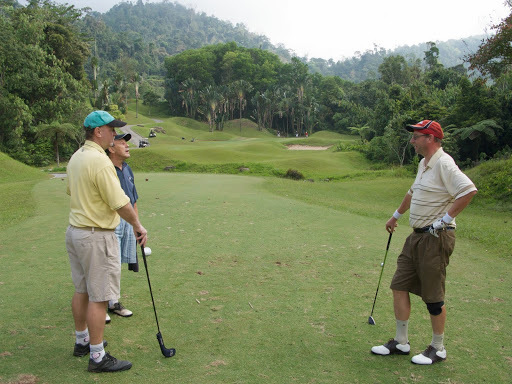 There was then a delay of almost an hour before flight 3 walked off the 18th, 10 minutes of it searching for balls within 150 metrs of the green!!! The last flight came in 90 minutes after the first flight. Maybe we need to bite the bullet and put up with the 10 minute drive to the 10th. 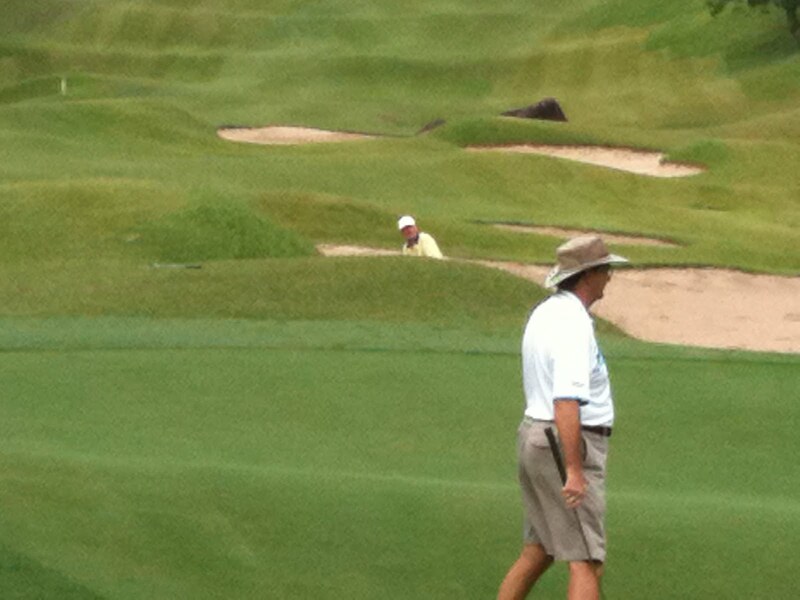 But even this will not help unnecessary slow play. Speed the game up guys. 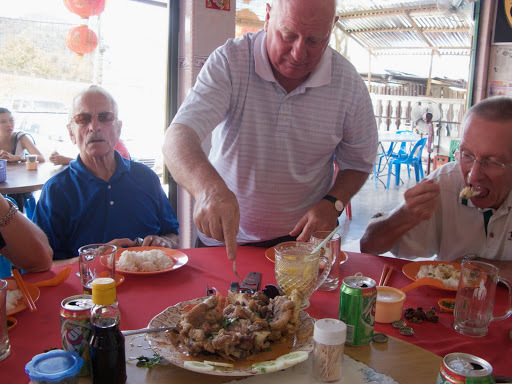 Poor Bob Simpson was sat at the restaurant for nearly an hour before anyone joined him. He text me with “Where is everone?” followed 45 minutes later with “Am I in the right restauant?”. We had left the changing rooms together! And he was in flight 2!!!! 2 members of flight 1 didn’t stay for lunch and Erol, their 3rd member had to wait for John who was in a later flight and I had to wait for George who was in the last flight. Erol & I had a beer at the 18th to pass the time while waiting for flight 3 to appear. Anyway, some lessons learned. At venues like this where we adjourn to an off site venue for lunch I will pre arrange the flights. This will help. 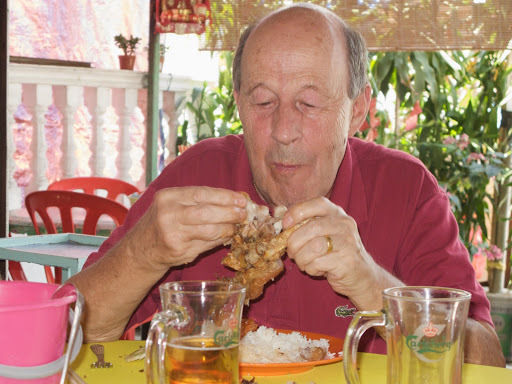 Lunch at Restoran 126 in the village was excellent and accompanied by much amber nectar and very reasonably priced. Despite the delays, a good day out. 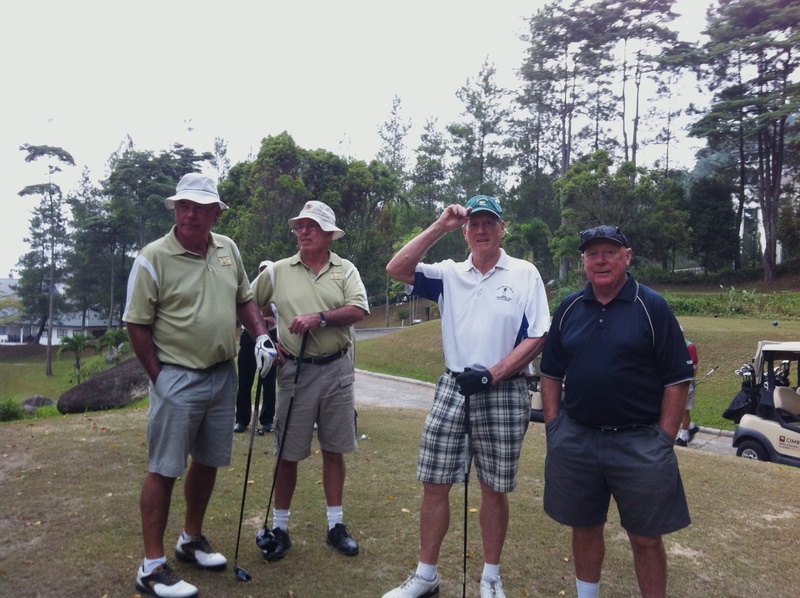 Geoff Parslow, Ted Parslow, John Laidley and Glen Wombwell warming up on the 1st tee. Well not exactly warming up … but Glen is warming his hands! 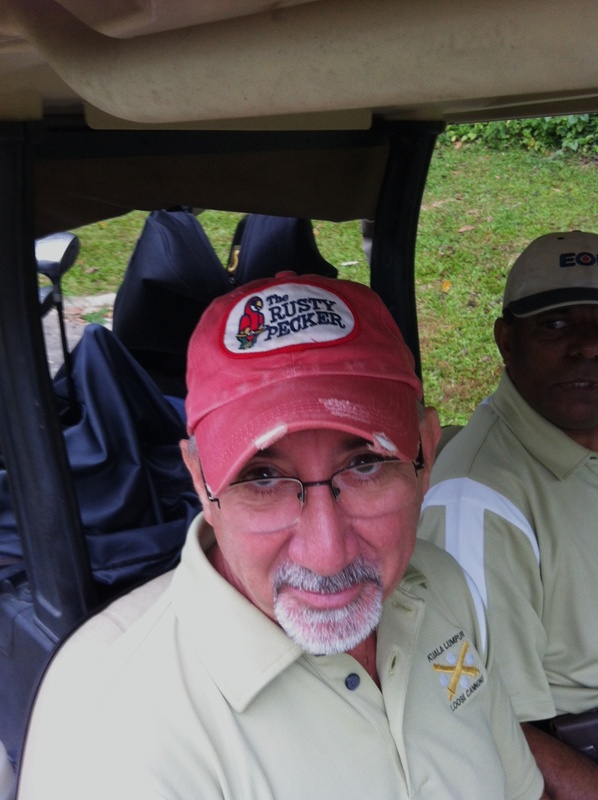 Erol Akinci and his “Rusty Pecker” at the 1st tee. 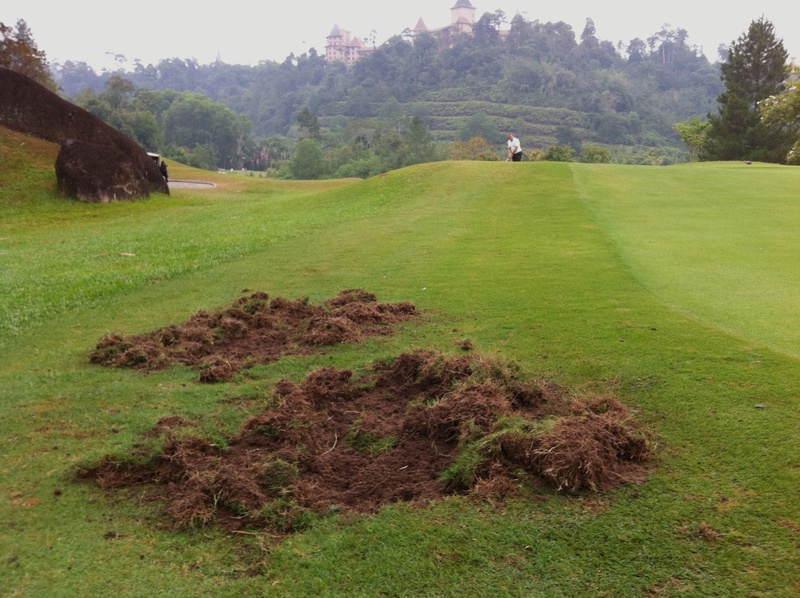 We thought much of the fairway damage on the course had been caused by wild boar action … but here is proof that Alan McNicoll was also to blame! 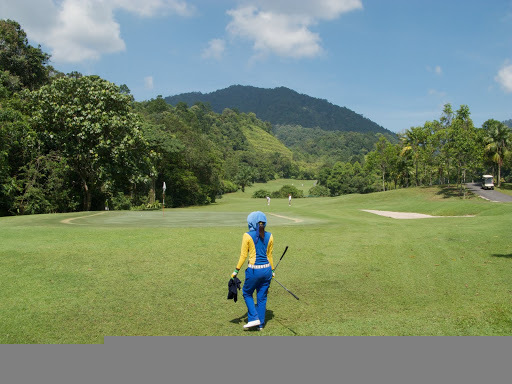 Panorama photo of the 4th hole. 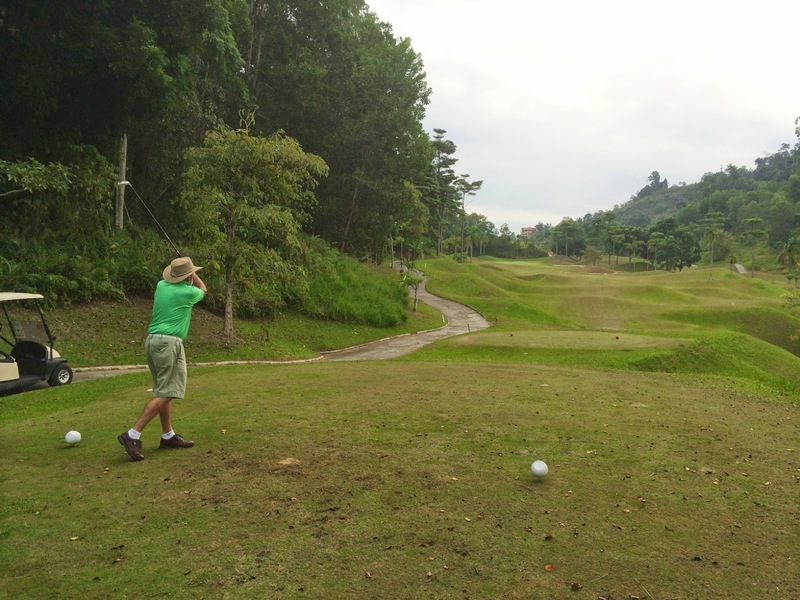 “Stop and smell the flowers” as famously quoted by golfer Walter Hagen. 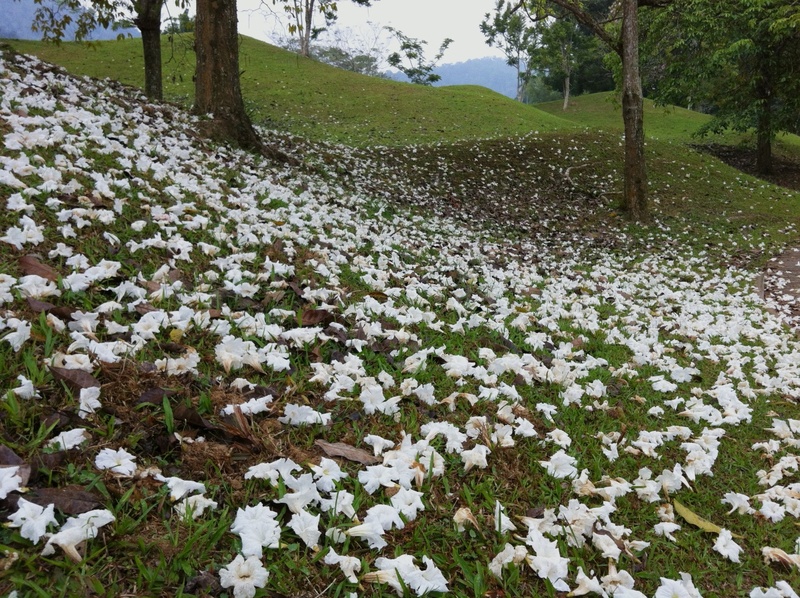 These beautiful flowers had dropped from the trees which surrounded the fairways on the 5th hole. 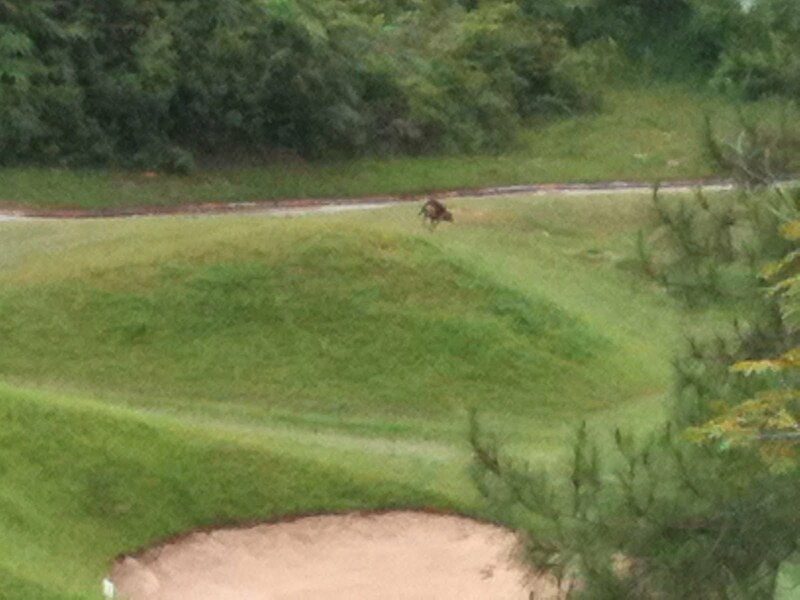 Here we see some wild boar damage caused just off the green on the 9th hole. The unmistakeable profile of Mr. Richard Moss. 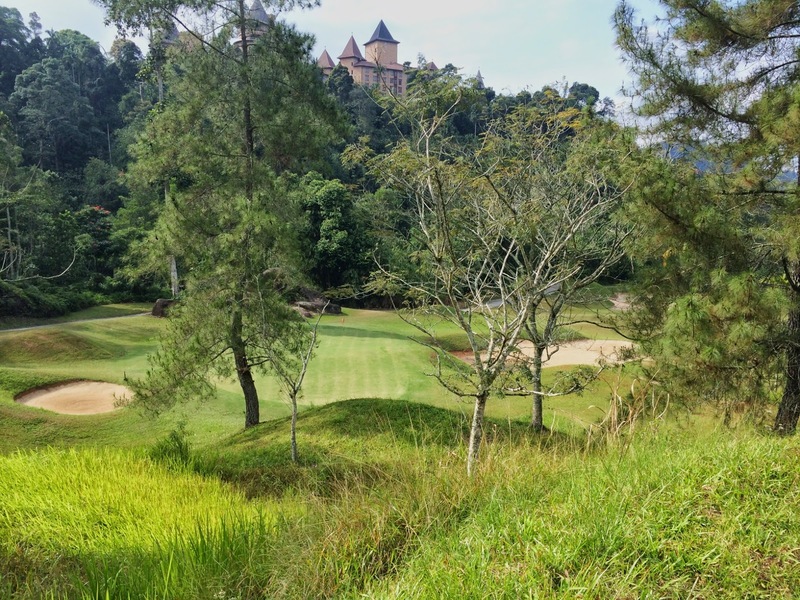 The Berjaya Hills course has some wonderful views over the surrounding hills and has the advantage of being relatively cool due to the altitude. 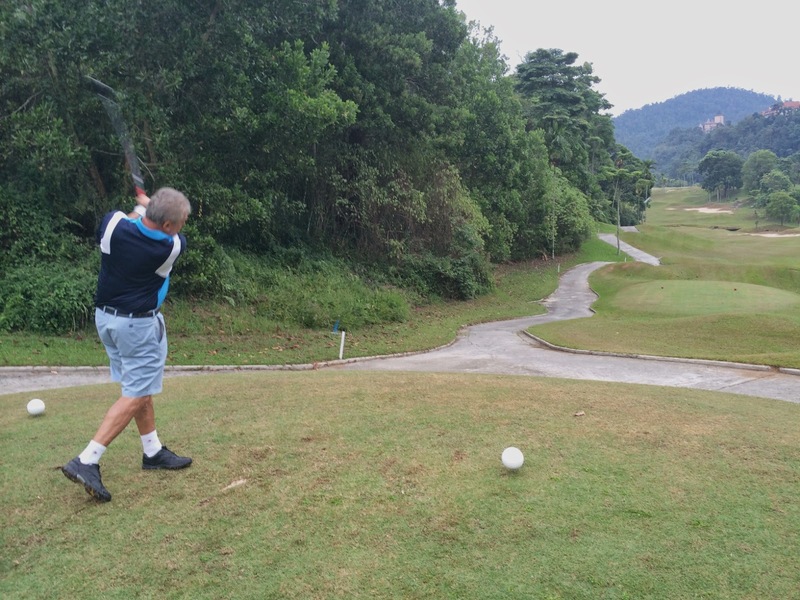 Alan McNicoll blasts one away with this new driver on the 10th hole. 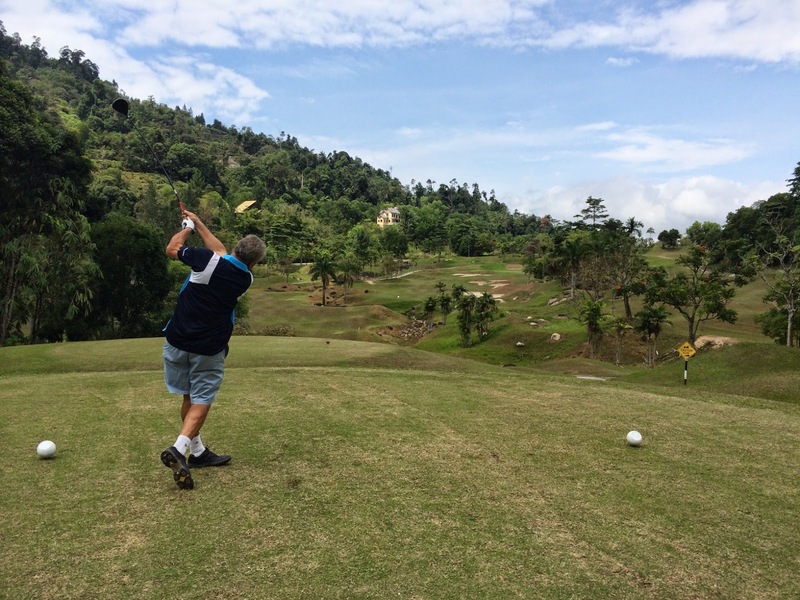 Richard Moss looking in awe at his drive on the 10th. 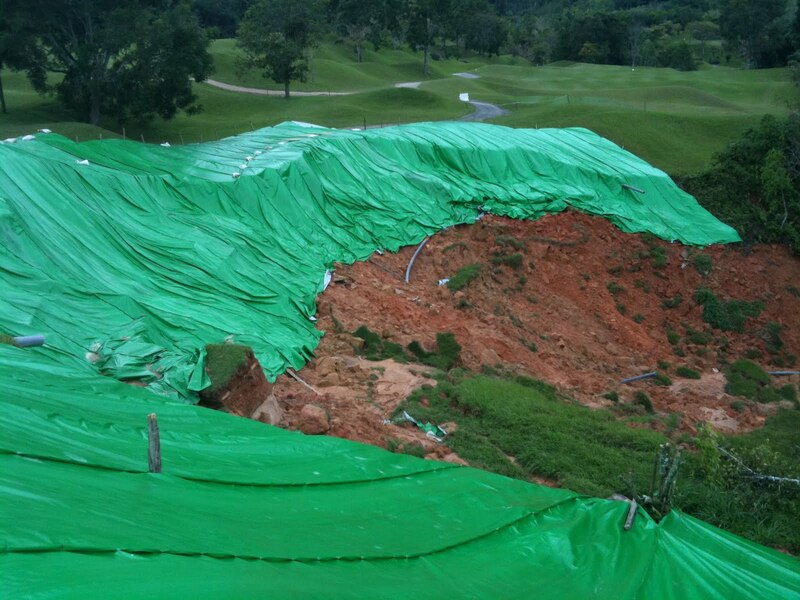 Panorama photo of the 10th hole green. Richard Moss in the valley of sin on the 12th. 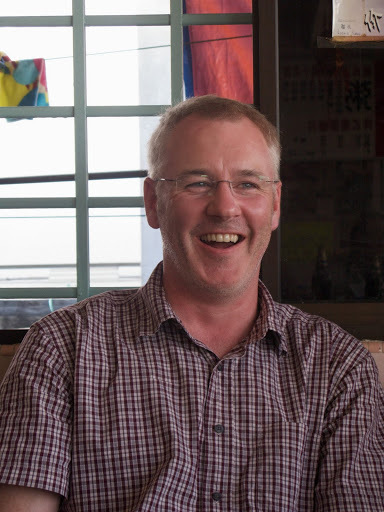 Geoff McLaws looking happy …. couldn’t say that by the 18th! 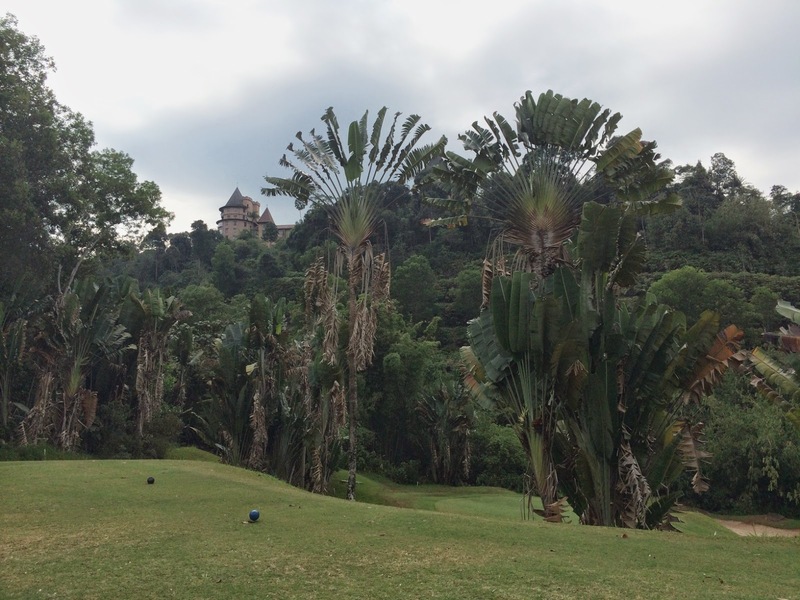 The bizarre Colmar Tropicale buildings nestle in the hills in the distance. Another fine swing from Alan McNicoll propels him further forward into triple figures. 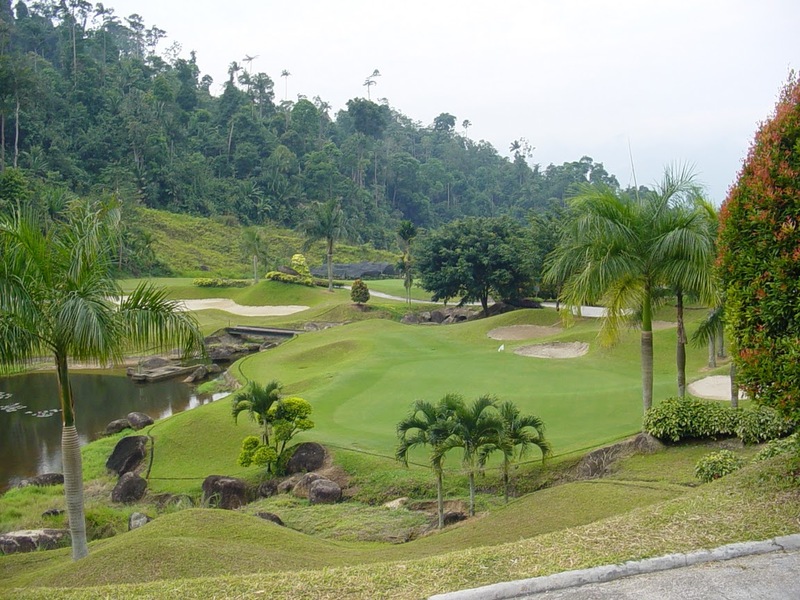 The fairly straightforward 16th to lull you into a false sense of security and confidence before the last two holes. 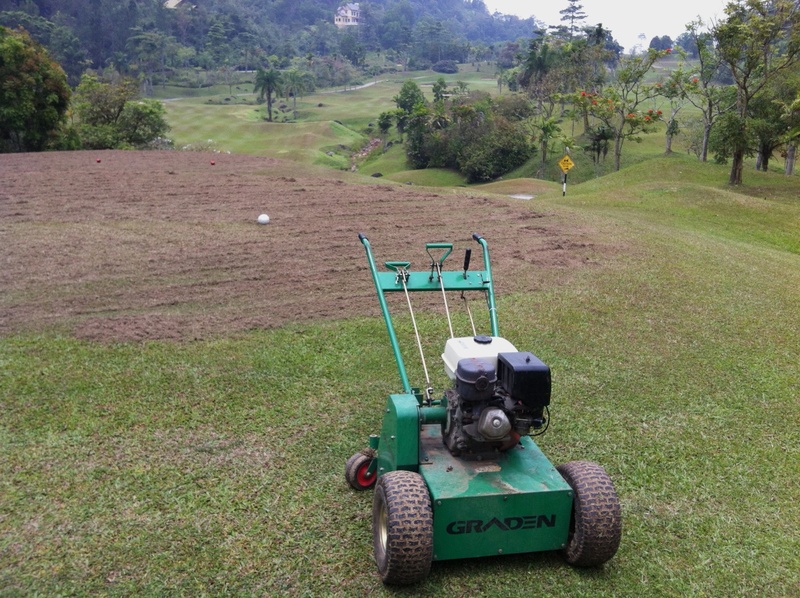 A scarifier machine had been in action on the 17th tee box. Looking back down the tough 17th hole it’s easy to see where you went wrong. 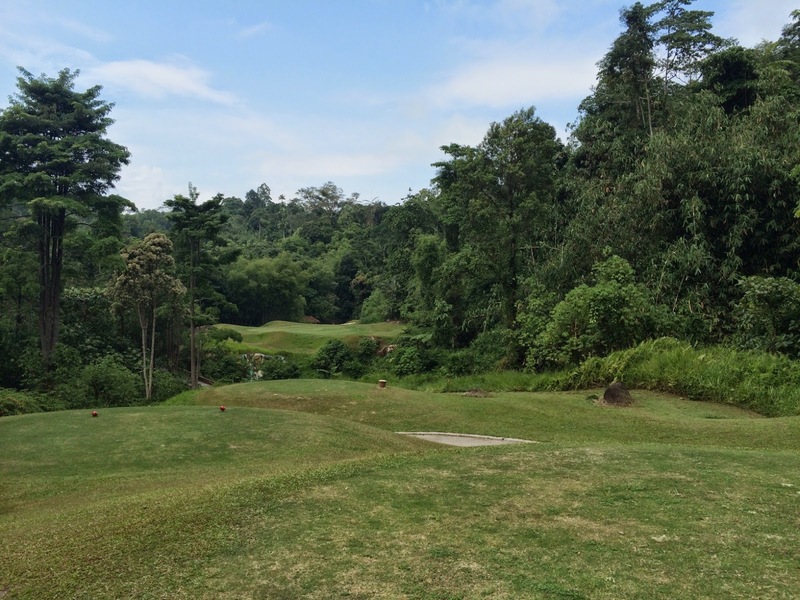 Something extra this week to complete your multi-media desires – some recorded sounds of the gibbons in the jungle surrounding the golf course. It sounded like they were all screeching with laughter …. 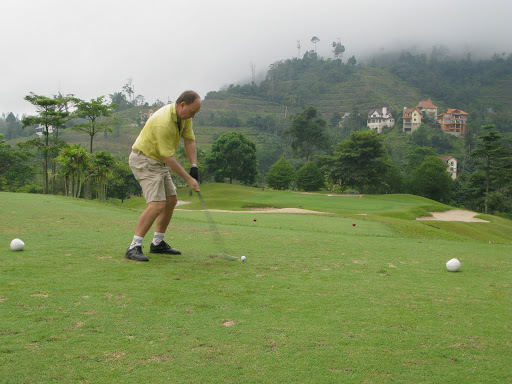 and this was probably exactly the case given the displays of our golf proficiency. 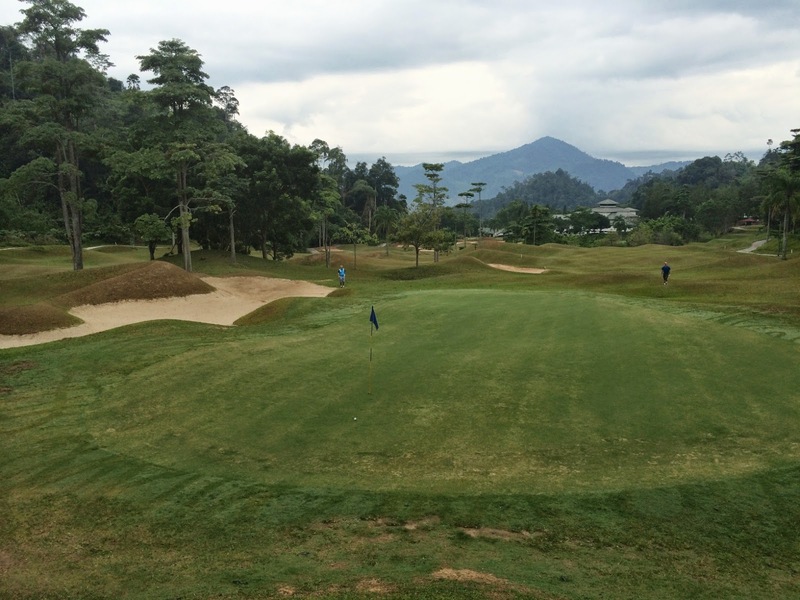 12 golfers pitched up for the Trophy Game at Berjaya Hills in cool overcast conditions. I say 12 pitched up but 3 of these, 2 of whom were relying on Reinli for a lift, arrived at 8:45; Reinli having gone back to sleep after his early morning call from Tom. 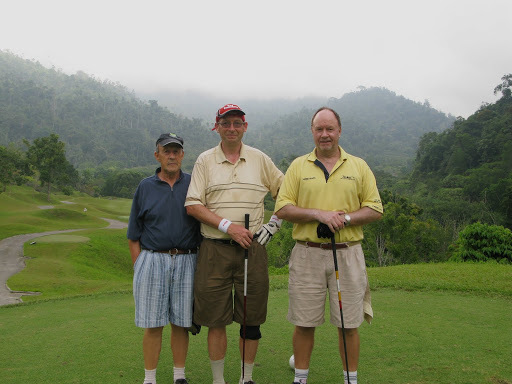 So, 2 flights teed off at 08:00 and the 3rd an hour later and got caught in the rain at the last hole. Reinli, you should be publicly pissed on. 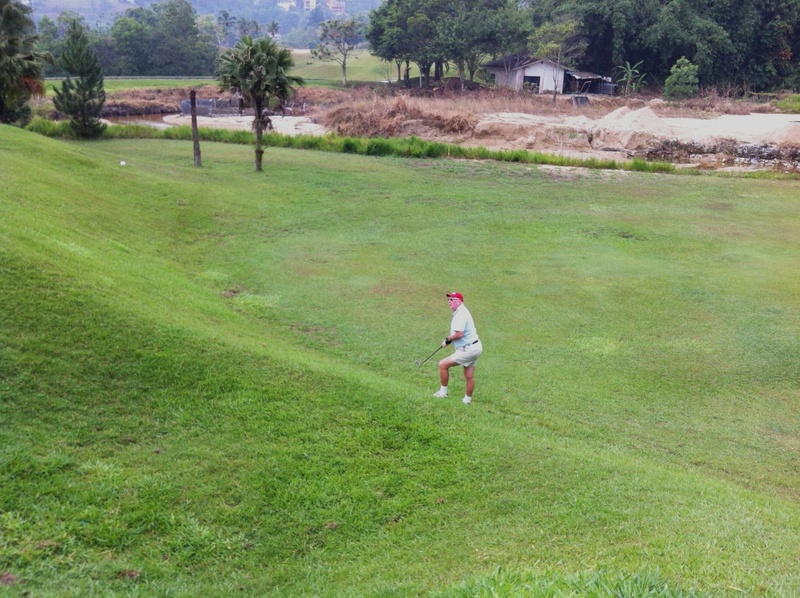 The course was in good condition but rather wet. Nevertheless it played well and we didn’t play winter rules although we perhaps should have. The traumatic drive to try and make up time and the soaking on the last didn’t however stop Reinli from collecting the Trophy with 38 points plus 1 bonus point for a total of 39. Nor did it stop John Laidley shooting 79 for lowest gross. 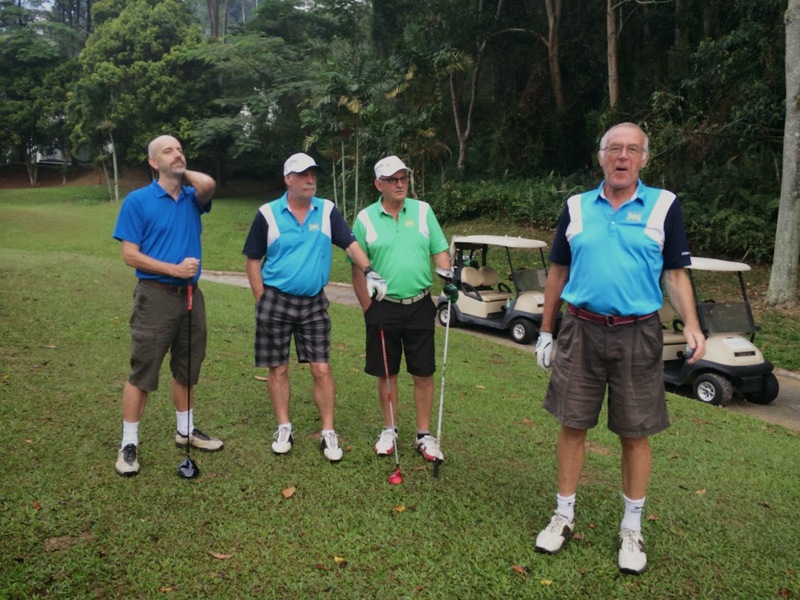 The runner up was Tony Morris with 35 + 3 and the most golf…just…was played by Raymond. M&M was taken at the Remember126 Restoran in the village and while the food was just OK the price was very OK. Thanks to Andrew and Richard for finding this place for us. Their sense of duty knows no bounds. We used to use one tooth fatty but the last time we were there the food was rubbish and the price outrageous so Fatty is out and 126 is in. 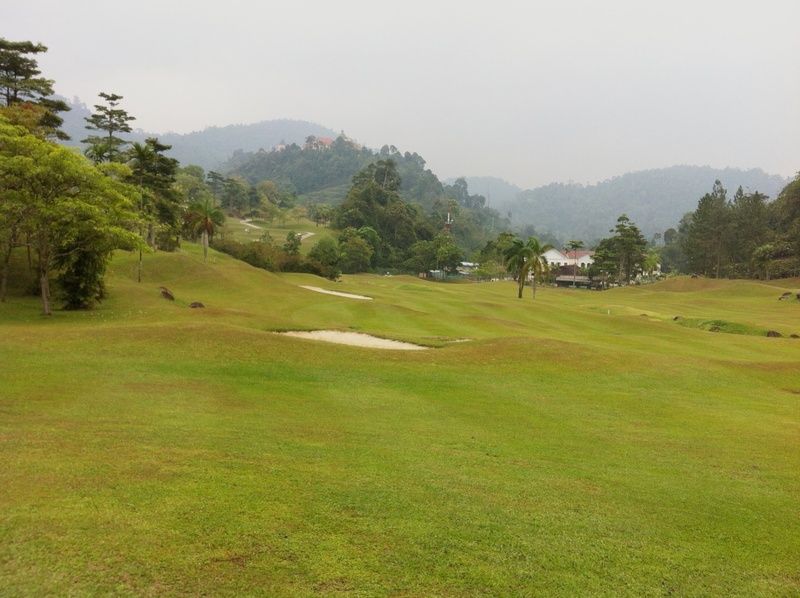 The Monthly Trophy Game will be played at Berjaya Hills. 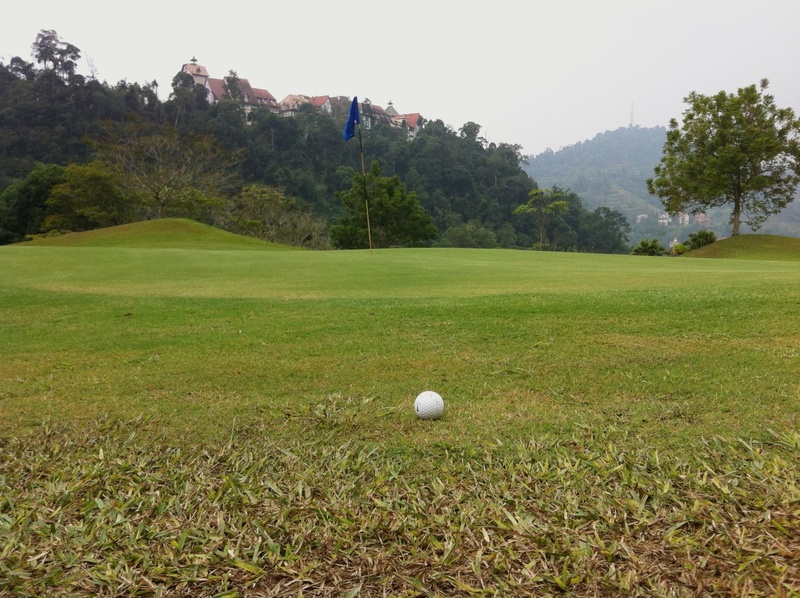 Tee off 08:00. Be there by 07:30 LATEST and confirm by emailing Mike Smith. This is a TOP PREMIER course. If you have the 2011 TP book it will cost you RM100. If you don’t have the book it will cost you RM180. The book costs RM180 from Alistair. As we will be playing all of the local TP courses through the year you are advised to get the book NOW. 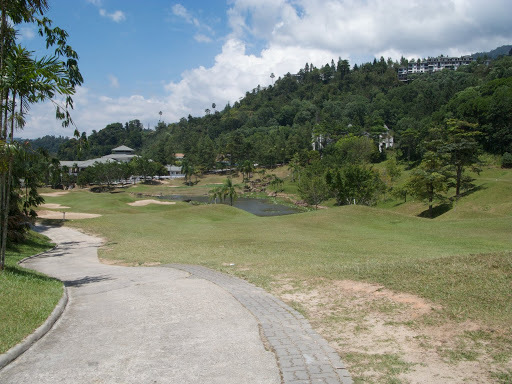 After the game we will drive down to Bukit Tinggi village for the prize giving and the usual M&M. The venue will be “Remember 126 Restoran”. After the game we will shower and depart imediately for the prize giving and makan. All players are requested to attend. Thanks to Andrew & Richard for their time so generously donated. 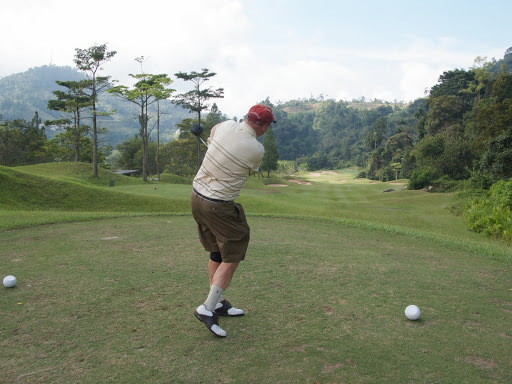 gross was John whilst most golf was played by Darren. benefit which was much appreciated by all attendant Cannons. Oldest Member made some comments about slow play in his flight. excessive the landlord provided 2 large bottles of Tiger gratis. 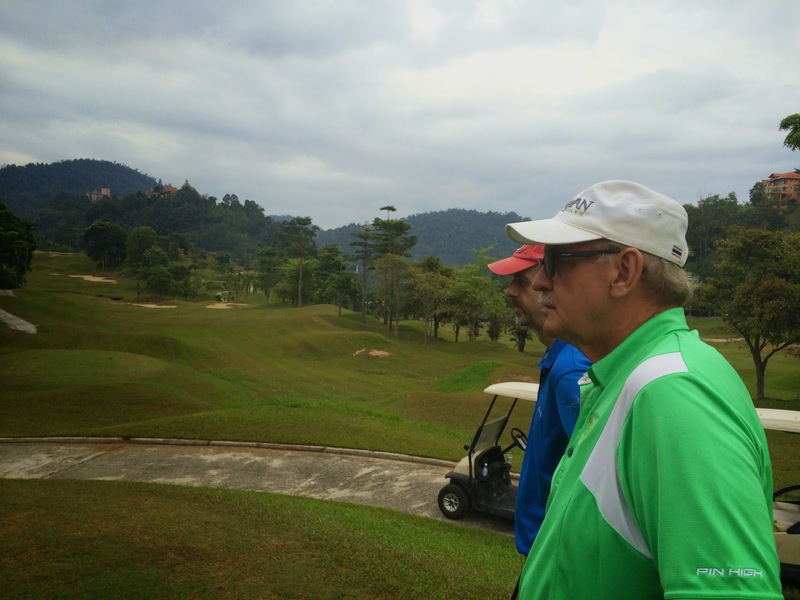 await his decision on the course for Tuesday Kajang Hills was mooted. 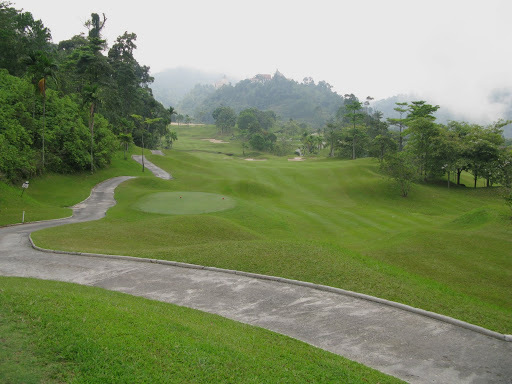 Next game will be at Berjaya Hills aka Bukit Tinggi on Tuesday 2nd November. 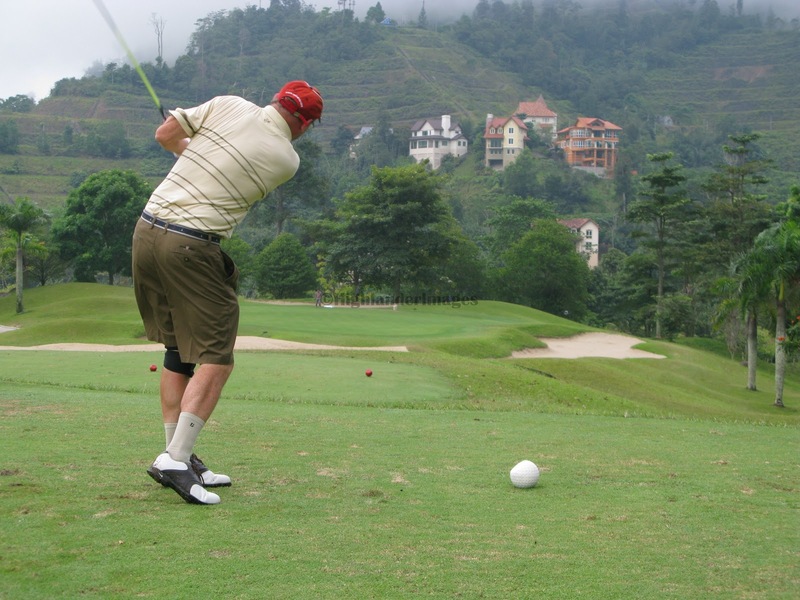 Be there for an 0800 tee off. 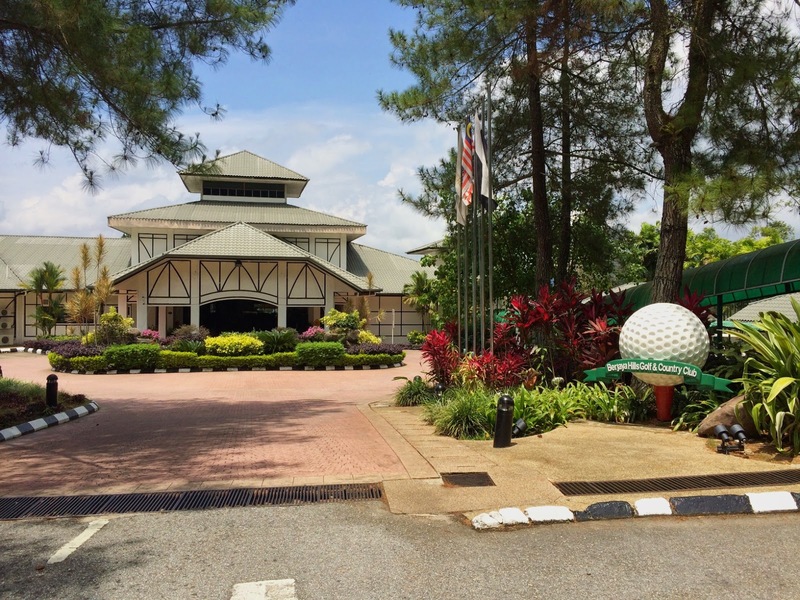 Ater the game we will immediately adjourn to Kampong Bukit Tinggi for makan and minum. 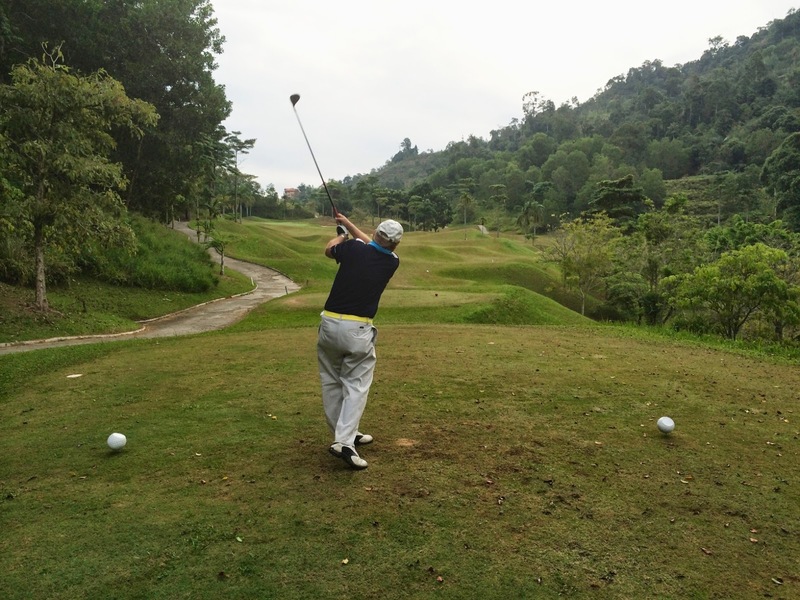 A record turnout of 16 players today at Berjaya Hills G&CC. 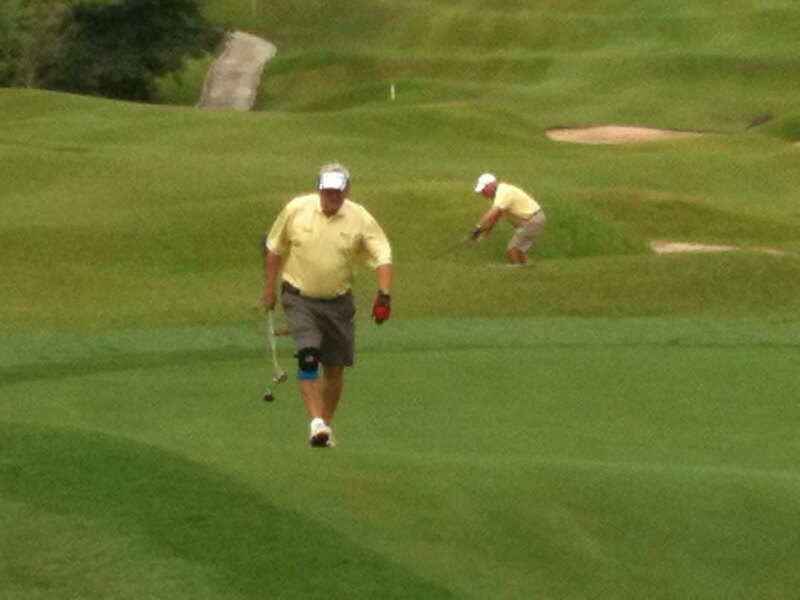 We teed off at 8am sharp with four groups, play being a bit slow given a few other slow players on the course. 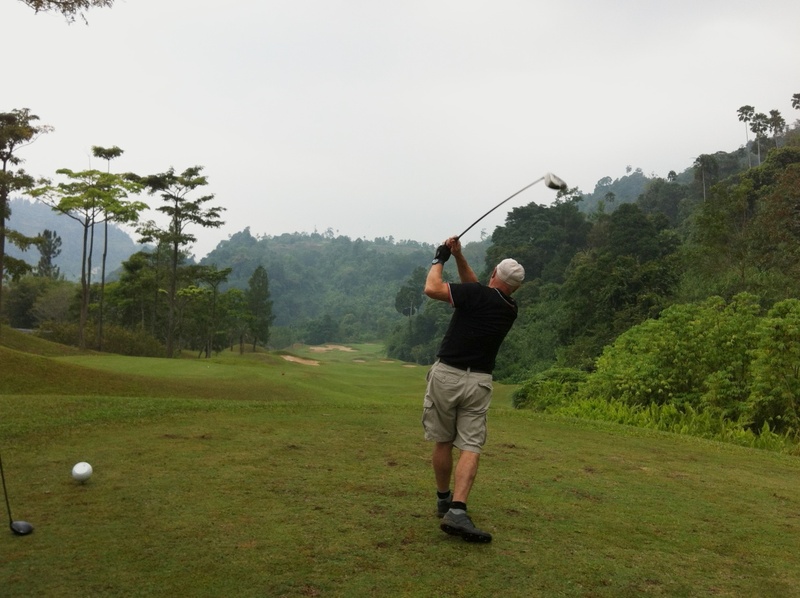 However the air was cool with early morning mist and cloud and the scenery very pleasant … some of us admiring the scenery from somewhat different angles on many of the undulating and hilly holes. 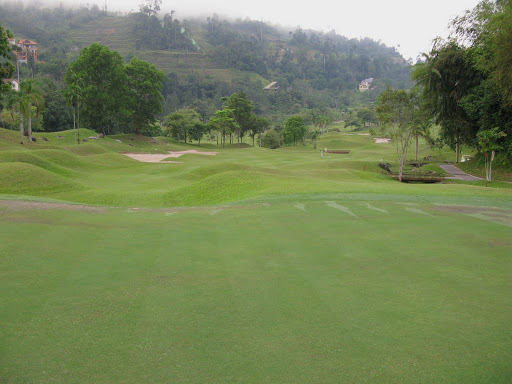 The state of the course was variable, the front 9 was ok but many of the holes on the back 9 were not up to par and some of the greens very sandy and full of a patchwork quilt of repairs. 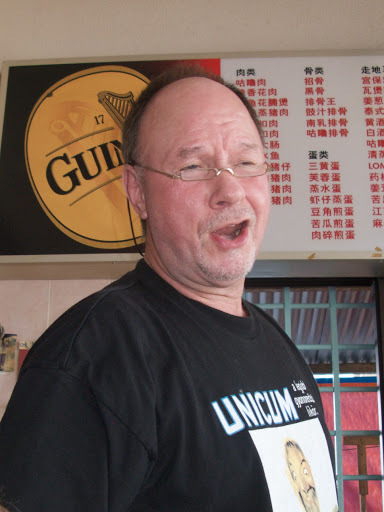 After the game we headed back down the hill for makan/minum at Mr Fatty’s Restaurant in Kampung Bukit Tinggi. It was good to see Richard Moss back in the fold from the Middle East who quickly took up his usual position in the restaurant at the end of a Tiger! 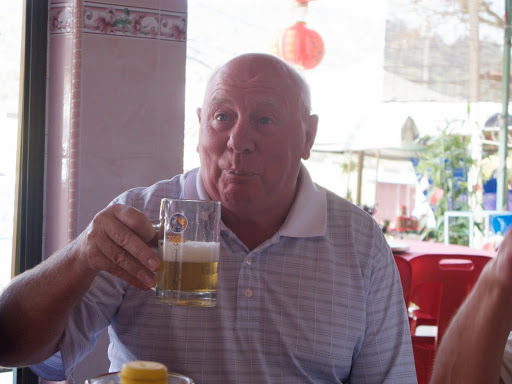 He also kindly sponsored the beers today – thank you Richard. 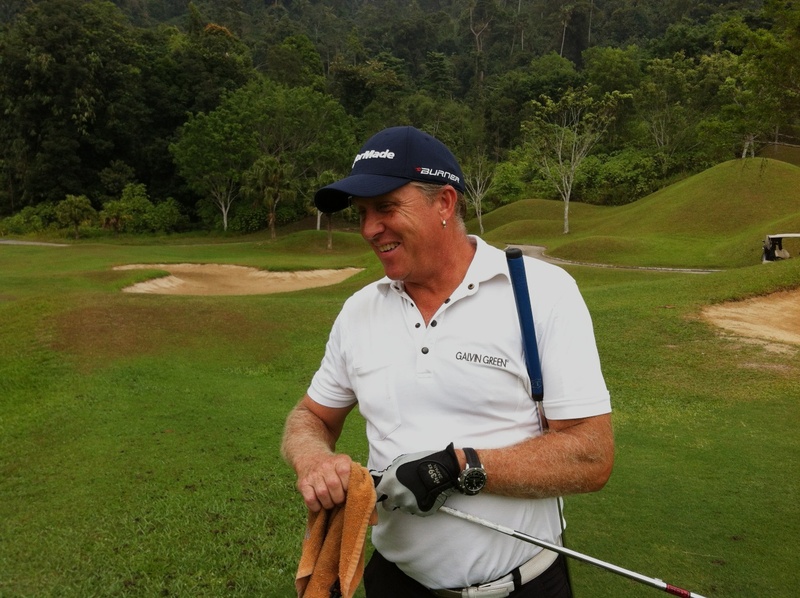 So the winner of today’s game was Glen Wombwell with a total of 44 Stableford Points – cut 8! Runner up was Andy Morrow with 33 – cut 1 point. 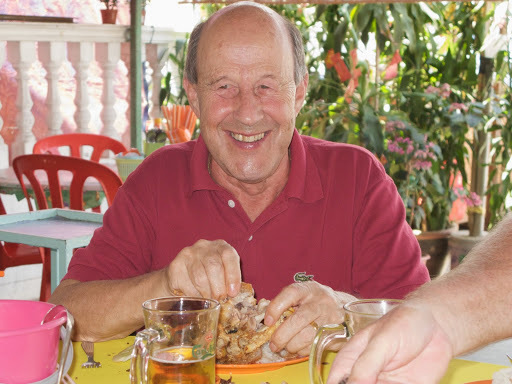 Raymond Keys for ordering the rather poor pork knuckles which turned out to be trotters! 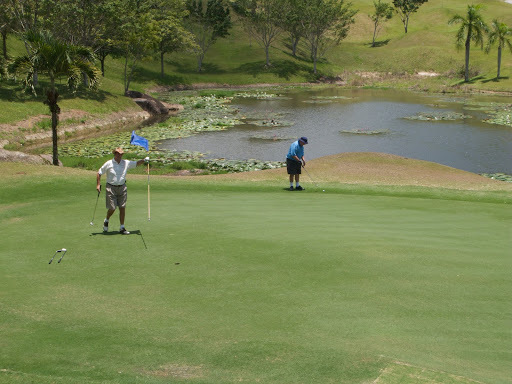 Stuart Taylor for failing to video Tony’s fantastic putt on the final green – claimed 40ft …. but I think not! …… any others may be considered and as an added bonus/complication I will be setting up the poll so you can vote for more than one person – this should make things very interesting! Finally a little video compilation of some “Loose Cannons” antics on the course today …. enjoy.